General Characteristics: Medium in height, slender, moderately spreading, maturing in about 12 months, producing fairly numerous oha (usually over 10); readily identified by mottled green and purplish leaf blades. Petiole: 70 to 85 cm. long, slender, lilac-purple flecked with streaks of purplish-black especially on lower half, distinctly purplish-black at edge, white at base, the apex whitish on outer surface and reddish-purple on inner. Leaf blade: 40 to 50 cm. long, 25 to 35 cm. wide, 30 to 40 cm. from tip to base of sinus, sagittate, fairly concave, conspicuously mottled with green and dark purple especially on lower surface; margins quite undulate; piko purple; veins light reddish-purple on lower surface of lobes; lobes obtuse to slightly acute with deep, narrow sinus. Corm: Flesh white with yellowish fibers; skin white with pink or light to dark purple leaf-scar rings. Inflorescence: Peduncle lilac-purple with occasional dark purple streaks; spathe 18 to 24 cm. long, the lower tubular portion 3 to 4 cm. long, green with lilac-purple flecks and a few purple streaks, the upper portion yellow, tightly rolled or sometimes open near constriction; spadix 6 cm. long, the sterile appendage 6 mm. long. Origin, and derivation of name: Native variety; called Uahiapele, or "smoke of Pele" because of smoky appearance of purplish-and green-mottled leaves and smoky gray poi made from the corms. 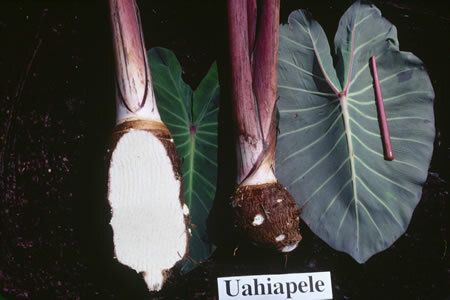 Distribution: Formerly grown to some extent at Ewa, Oahu, under wetland culture, but at present found most commonly on Hawaii and occasionally on Kauai, under upland culture. Use: Makes a high-quality smoky-gray poi; formerly highly prized for medicinal purposes and as an offering to the gods. Remarks: This variety has many of the characteristics of the Kai group, in particular the tough, rubbery consistency of the cooked corm.